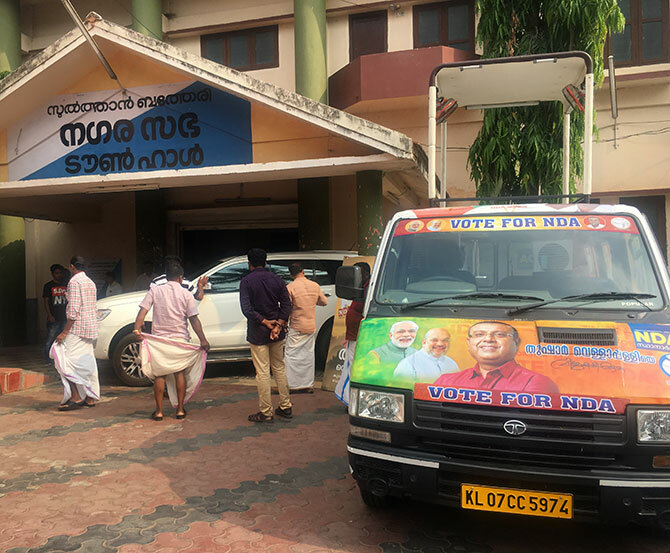 Unlike the LDF and NDA nominees who are at ground zero and campaigning hard every day, the Congress candidate's campaign is undertaken in absentia, dependent on an army of local and imported from the rest of Kerala Congresswomen and men. Rediff.com's Nikhil Lakshman reports from Wayanad. 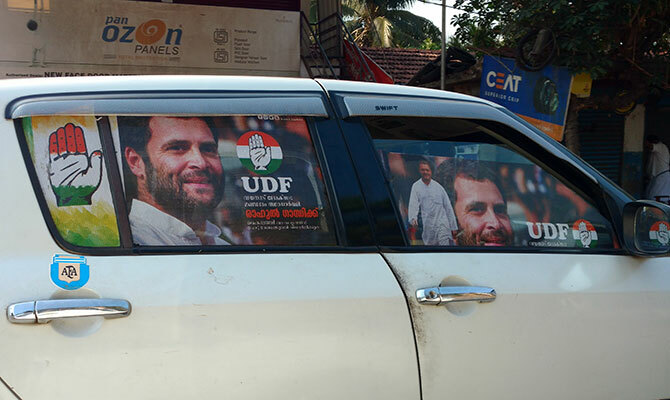 IMAGE: A car with a smiling Rahul Gandhi all over it makes its way in Wayanad. Che Guevara keeps Marx, Engels, Lenin and Bhagat Singh company under a tree in Payeri, a village in Wayanad's Sulthan Bathery district. A few feet away, a conch anchors a steel frame with the letters B J P atop of it. A poster of a dimpled Rahul Gandhi hangs incongruously on the frame. About a score men hang around, greeting each with raised clench fists and 'Sakhav', the Malayalam word for comrade. It is a political tableau that one encounters rarely though it is common in the Indian Left's solitary electoral bastion, Kerala. In the distance, one can already hear the rousing roar of calls to gather and hear P P Suneer, the Left Democratic Front's candidate for the Lok Sabha election in Wayanad. Political observers attribute the 2014 result to Shahnavas's absence from Wayanad, a consequence of a serious illness which claimed his life in November 2018. "We were expecting a Congress candidate here since they won in 2009 and 2014," says P Sandosh Kumar, a Communist Party of India state committee member and the LDF convenor for Wayanad in this election, "but Rahul Gandhi himself has come and become the UDF (the Congress-led United Democratic Front) candidate. Unlike other Congress leaders, Rahul is the final say in the Congress." Howls of anger from the Communists greeted Rahul's candidature, though Sandosh Kumar insists that the Left does not feel betrayed by the Congress president's choice of electoral borough. "It is not a question of betrayal," says the articulate CPI leader who has an MPhil from JNU, "It is political short-sightedness and immaturity. Rahul, as the leader of the largest democratic secular party in the country, should not try to divide the secular forces." Likely concerned by the possibility of defeat in Amethi, his Lok Sabha constituency since 2004 at the hands of Textile Minister Smriti Irani -- his margin of victory had been slashed from 2009's 370,198 to 107,903 in 2014 -- his advisers, which includes the Kannur-born K C Venugopal, prevailed on Rahul to opt for a Southern berth in Parliament. 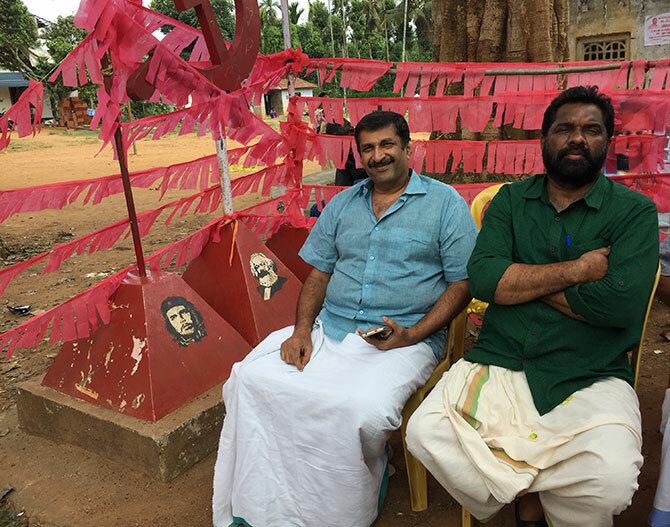 IMAGE: P P Suneer, the Communist Party of India candidate in Wayanad, right, with Malayalam actor and CPI activist Jayan Cherthala. Suneer, who is about 50, has the hardy appearance of one who has toiled long -- one newspaper account says he has been an activist since he was 10 -- and hard for the working class. He is a Muslim in a district with 28.65% Muslims (contrary to Bharatiya Janata Party leader Narendra Damodardas Modi's allegation, Hindus are the dominant faith in Wayanad with 49.48% of the population) though Sandosh Kumar denies that Suneer's religion played a role in his choice as the Left's candidate. "We don't pick up candidates based on their religion. Suneer is a party activist and had led pro-people agitations. He is a known leader in the Malappuram part of Wayanad district. Obviously, he is the available best choice as far as the CPI is concerned." 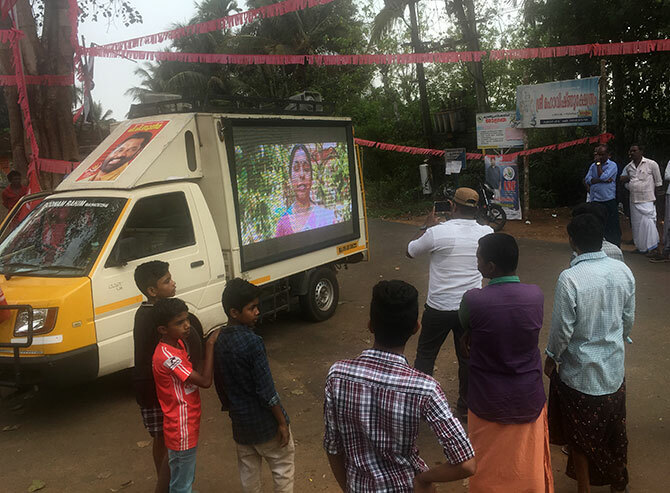 IMAGE: The CPI van which tells villagers in Payeri more about Suneer. IMAGE: Bharatiya Janata Party and Bharath Dharma Jana Sena supporters. 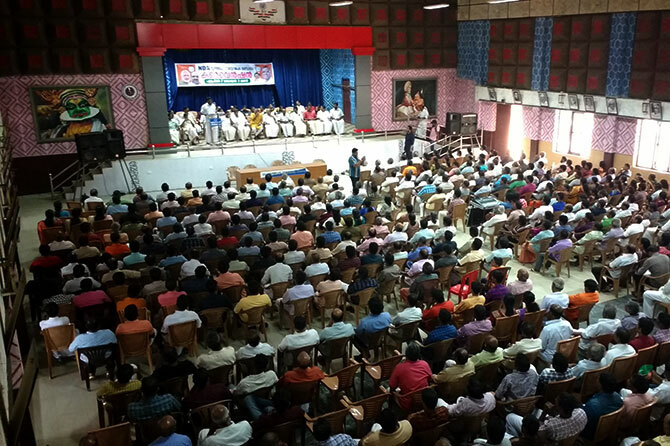 at the town hall in Sulthan Bathery, April 7, 2019. IMAGE: The NDA van ready for the BJP-BDJS road show. "Amitbhai said Rahul Gandhi is going to contest from Wayanad," Thushar tells Rediff.com the next morning at a bungalow in Kalpetta, "and we want you to contest. I said, fine." Shah's gambit, like all his electoral decisions, was burnished in the kiln of cold political logic. BJP nominees had come third in 2009 and 2014, though in five years the party's vote share in Wayanad had increased from 3.8% to 8.83%, and a corresponding increase of nearly 50,000 votes. By all accounts, Thushar has no chance of winning Wayanad -- the contest is between Rahul and Suneer. But Amit Shah is playing a bigger game. Thushar and his father Vellapally Natesan run the Sree Narayana Dharma Pariplana Yogam -- the SNDP -- which champions the Ezhavas, the backward toddy tappers community, in south Kerala. The Ezhavas, the largest component of the state's Hindus, have traditionally been supporters of the Left in Kerala. This understanding is brewed with its experiment in north Kerala where the Thiyyas -- the caste equivalent of the Ezhavas in Malabar -- form the spine of the local Rashtriya Swayamsevak Sangh cadre. 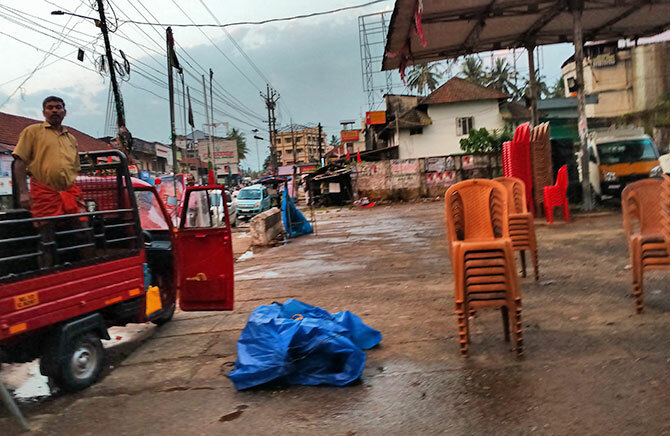 The bulk of Thiyyas in Malabar remain with the Left and the murderous clashes between the Marxist and RSS cadres have turned Kannur, the capital of Malabar, into the nation's political killing hub. "The BDJS was an experiment that has lost its relevance," argues Sandosh Kumar, the Communist. "Amit Shah and Modi were hoping to transfer north Indian politics, where caste is a dominant factor, to Kerala. They wanted to divide Kerala on the basis of caste. Of course, people in Kerala are proud of their caste, but the BDJS experiment has failed. The BDJS is a gone case." IMAGE: The crowds stream out of the BJP-BDJS meeting. There are three rows of men in the Malayalee uniform -- clean white shirts and mundus (dhotis) -- on stage, almost to a man from the BJP. Thushar Vellapally is a sartorial aberration among this group, dressed in a churidhar-kurta. IMAGE: The candidate is yet to emerge for the road show. 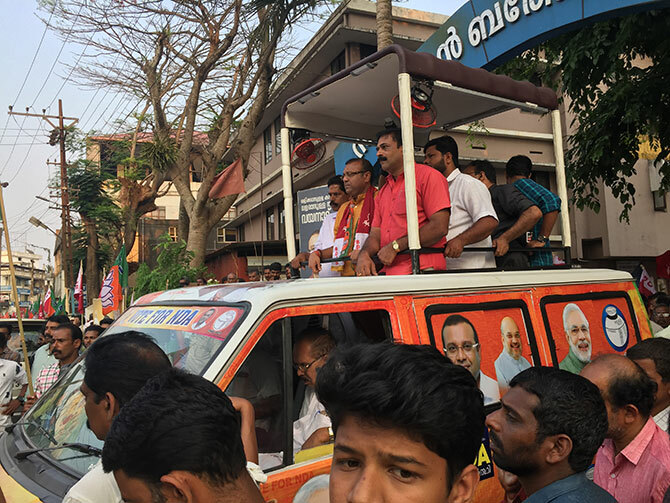 IMAGE: Thushar Vellapally sets off on his road show in Sulthan Bathery town. Flags of both the BJP and BDJS are distributed to cadres who are to march ahead of the candidate's van (which has two fans on the roof to provide Thushar some respite from the evening heat). In contrast to the BJP's distinctive standard, the BDJS flag is simple, almost as if it was created by a child. Thushar's event copies from the play book, deploying a group of enthusiastic young men whose drumming usher a verve otherwise absent from the road show or what a senior Congresman later that evening wryly calls, "Vellapally's no show." 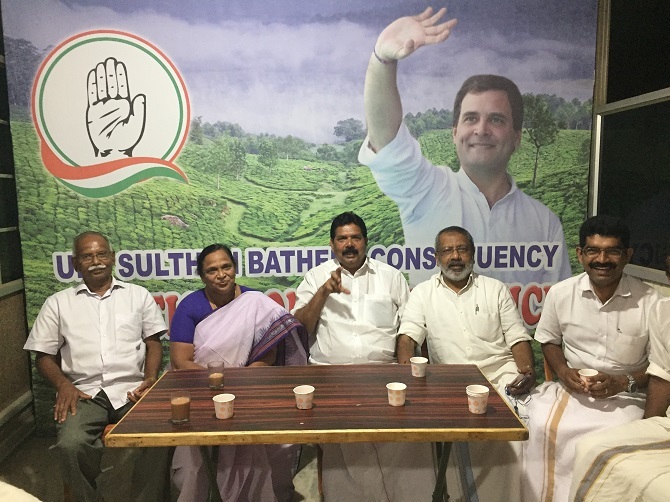 Unlike Suneer and Thushar, who address countless street meetings daily, meet with sundry local dignitaries (Monday, April 8, for instance, Thushar had lunch with the archbhishop), Rahul's campaign is hobbled by his absence from Wayanad. His campaigners, many of them pensioners, instead employ the old style door to door method to reach out to voters. Though there is a social media desk at the UDF office in Sulthan Bathery, the Congress's social media presence in Wayanad -- which is run by the efficient Divya Spandana from New Delhi -- is minimal compared to Thushar's WhatsApp interactions which are so numerous that one has had to mute it. 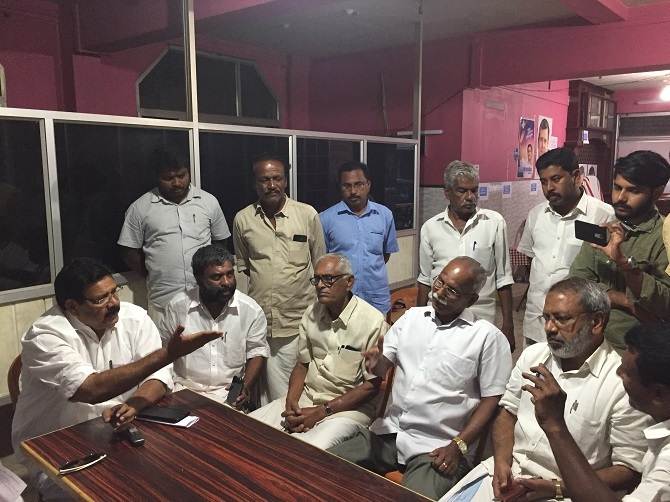 IMAGE: Local Congress leaders debate details of the Wayanad constituency at the UDF office in Sulthan Bathery. Around the table at the UDF office in Sultan Bathery, the mood is buoyant. The Congress leaders -- who include K C Rosakutty, a retired teacher and former MLA (1991 to 1996) from Suthan Bathery, and K K Abraham, secretary, Kerala Pradesh Congress Committee -- declare their euphoria that Rahul has chosen Wayanad. Will Rahul retain Wayanad if he wins Amethi as well is a question that flutters among the Congress group -- and is no doubt something they must be asked on the campaign trail by voters anxious not to waste their vote on a candidate who will abandon the constituency and stay put in his traditional borough. The opinions around the table are divided. "His party cannot find a sure seat elsewhere," says the professor, "that is why he has come to Wayanad. If he wins Amethi and Wayanad, he will give up Wayanad." IMAGE: Congress leaders in Sulthan Bathery gather against a backdrop of Rahul Gandhi. Others feel he will stay and let his sister contest a by-election in Amethi, and there are others who believe even if he gives up Wayanad, his presence in the fray could bring much needed projects to the district -- like a railway line, for instance. Wayanad can only be reached by road -- and as Dr Sheeba Joseph, the first women's principal of the St Mary's College, the premier educational institution in Wayanad, tells Rediff.com, many of her students have never traveled by train! Rahul's candidature has also meant a headache for Mulapally Ramachandran, minister of state for home in the Manmohan Singh government and the current KPCC president. 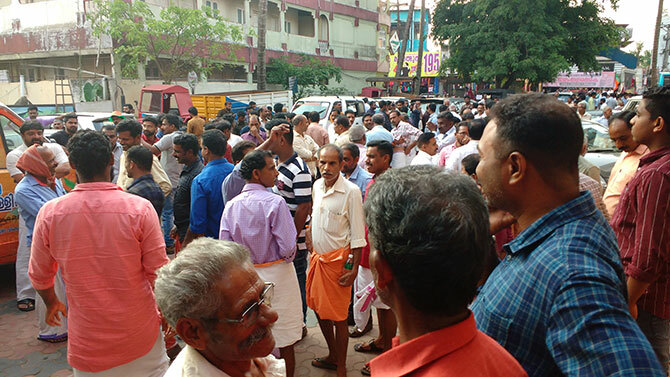 According to a Times of India report, local Congress leaders from constituencies nearby -- Kannur, Kozhikode, Vadakara -- have disappeared from the campaigns in those areas, and surfaced in Wayanad to campaign for the Leader, and thereby earn some notice and prominence among the Congressmen who matter in New Delhi. 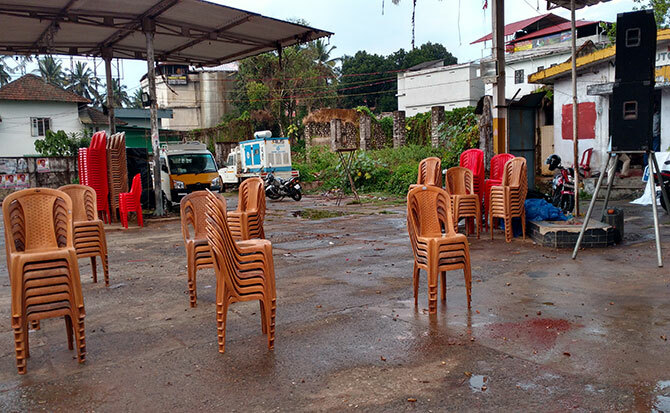 In Kalpetta, the district headquarters, there is no Congress presence. Suneer's posters dominate the local landscape with Thushar's smiling visage (Kerala must be the only state where the Modi-Shah combine are assigned a nondescript spot on many posters) coming in second. 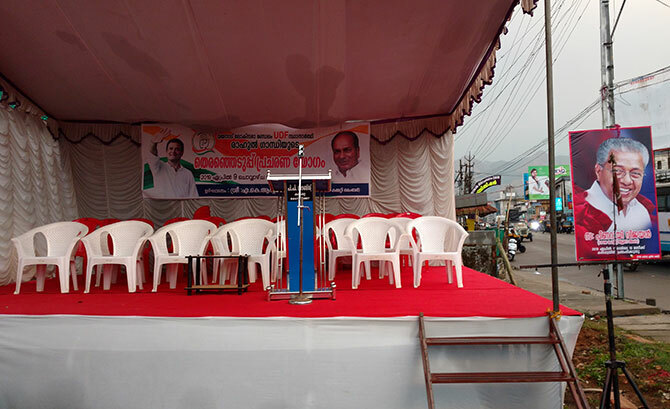 On Monday evening, Congress vehicles travel up and down the main street in Kalpetta, inviting residents to hear A K Antony -- Dr Singh's defence minister -- speak in the town. IMAGE: The A K Antony meeting that never was, above and photographs below. By Tuesday morning, posters of Pinarayi Vijayan -- the current chief minister who is cast in the unsmiling mode of Soviet apparatchiks though his unfamiliar beaming visage currently welcomes visitors all over Wayanad -- have appeared near Antony's meeting site. It is as if the the former Kerala chief minister will appeal for votes for Rahul under Pinarayi's gaze. The Congress meeting does not happen. A torrential summer downpour had cast doubts over Antony's campaign pit stop. When the rain ends comes the news of K M Mani's death. The veteran leader of the Kerala Congress -- an influential party of the Christians in south Kerala, not to be confused with the Congress Rahul leads, and a constituent of the UDF -- had been a powerful figure in state politics and Antony didn't want to send out the wrong message by addressing an election rally. "Is the meeting over?" 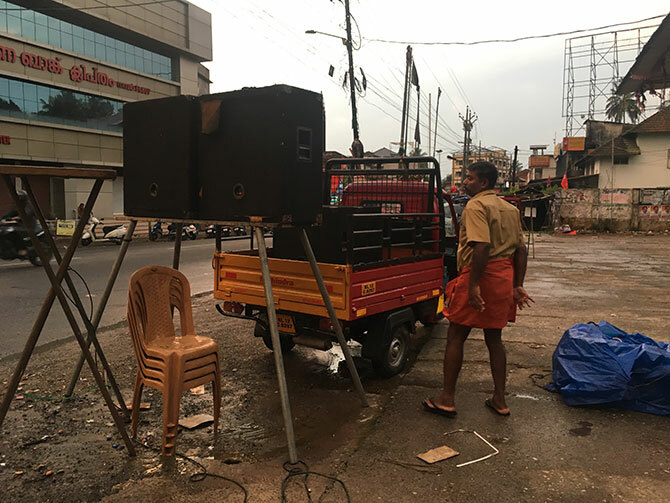 we ask the men carting away the speakers and stacking those plastic chairs which are a constant at Indian marriages and election rallies in states where they won't be stolen. "Didn't you hear?" one worker responds. "K M Mani died." 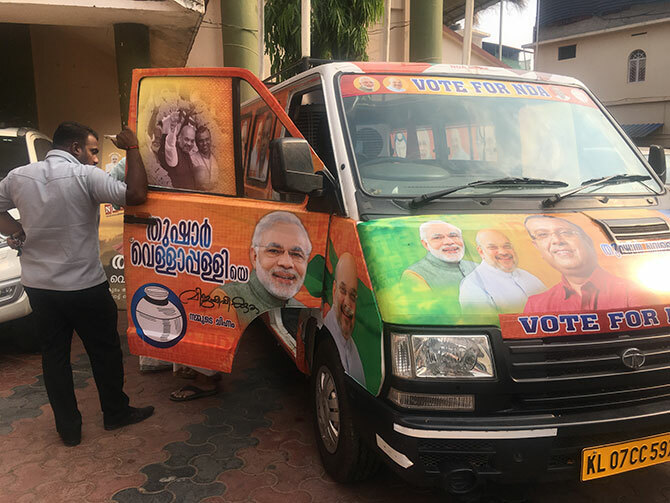 Sanil, Thushar Vellapally's media coordinator, tells Rediff.com that Modi is expected to address a rally in Kozhikode on the 12th, that "Amitbhai and Smriti Irani" are both expected in Wayanad in the days running up to April 23, voting day. Whether all this BJP activity will carry credence with Wayanad's voters -- especially, the first timers who seem enamoured by Rahul's decision, no matter what their political allegiance -- remains to be seen. But at Payeri, P P Suneer, Rahul's main rival, has no doubt about the electoral outcome. "Wayanad," he tells Rediff.com, "will be Rahul's Waterloo."